Beautifully engraved certificate from the Los Angeles Airways, Inc issued in 1969. This historic document was printed by the Jefferies Banknote Company and has an ornate border around it with a vignette of the company's logo. This item has the signatures of the Company’s President and Secretary and is over 40 years old. Folds from original mailing. 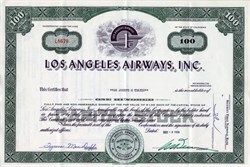 Los Angeles Airways, Inc., was incorporated on May 11th, 1944. The company began a mail service circuit in the San Fernando Valley on October 1st, 1947, and thereby became the first helicopter-scheduled service operator. Two further circuits were opened, one on October 15th and the other on January 8th, 1948. A shuttle service was also established between the Los Angeles post office roof and the International Airport. Passenger services were inaugurated in November 1954 and these services now link ten points with Los Angeles International Airport—S.55s are used on these services and the S-51s operate the mail flights. Head Office: Los Angeles, Cal., U.S.A.
Executives: C. M. Belinn, president; M. J. Burke, secretary; J. T. Kane, treasurer. Fleet: four S-55, three S-51. In 1954 the company carried about 3,500 tons of mail and express. Los Angeles Airways (LAA) was a helicopter airline that was based in Los Angeles, California. Los Angeles Airways offered services to area airports as well as Disneyland from Los Angeles International Airport. LAA is noted for several firsts, including the first regularly scheduled helicopter mail service on October 1, 1947 In addition LAA was the first civil operator of the Sikorsky S-61 introducing them on March 1, 1962 for a purchased price of $650,000 each. Los Angeles Airways ceased operations in 1971 after being purchased by Golden West Airlines. On May 22, 1968 Los Angeles Airways Flight 841 crashed in Paramount, California resulting in the loss of 23 lives. The accident aircraft, N303Y, serial number 61060, was a Sikorsky S-61L. On August 14, 1968 Los Angeles Airways Flight 417 crashed in Compton, California resulting in the loss of 21 lives. The accident aircraft, N300Y, serial number 61031, was the prototype of the Sikorsky S-61L.